Editor's Note: Get our experts best insights on how to play profitable opportunities like this with Bill Patalon's Private Briefing. Learn more here. The Ambarella stock price has climbed 81% in 2015, compared to a gain of just 1.1% for the Dow Jones Industrial Average in the same time. And it climbed 1.2% higher afterhours today after another encouraging earnings report. 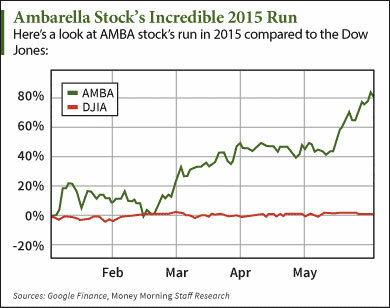 Since Money Morning's Defense and Tech Specialist Michael A. Robinson first recommended Ambarella Inc. (Nasdaq: AMBA) stock to readers in August 2013, AMBA stock is up nearly 415%. We recommended AMBA again on April 29. Since then, it's up another 27%. It's still not too late for investors who missed those gains on Ambarella stock. Ambarella is a video compression and processing-technology company. It is best known for developing the technology behind GoPro Inc.'s (Nasdaq: GPRO) wearable cameras. AMBA is a small-cap stock with a market cap of just $3 billion. After the bell on Tuesday, the company reported earnings per share (EPS) of $0.71 on revenue of $71 million. Analysts had predicted EPS of $0.59 on revenue of $67.36 million. Earnings were up 184%, while revenue climbed 73.5%. Gross margins for the quarter were 64.7%, compared to 62.5% last year. Today's report continued the company's strong earnings track record. In the previous four quarters, AMBA beat earnings estimates by an average of 29%. But the earnings report wasn't the only "Buy" signal we've received for Ambarella stock this week. On Monday, two investing firms raised their price targets on AMBA stock. Barrington reiterated its "Outperform" rating on Ambarella stock and raised its target 29% to $97. Finally, Pacific Crest raised its target 23% to $96. AMBA opened Tuesday at $91.44. So hitting those price targets would be an additional gain of 5% and 6.1% from today's price. Another thing boosting AMBA stock is its partnership with Google Inc. (Nasdaq: GOOG, GOOGL). In November, it announced a partnership that centered on Google's "Helpouts" service app. "Helpouts" will let teachers, counselors, doctors, home repair specialists, personal trainers, and others offer their paid or free expertise via real-time online video. Google is tapping Ambarella to provide the chips.